Andy Murray says he will play in Great Britain's Davis Cup quarter-final against Serbia in July - if his body allows him. The Scot, 28, led Britain to their first Davis Cup triumph for 79 years in 2015, and their title defence continues with a trip to Belgrade in July. However, the tie will be played on clay just five days after the Wimbledon final. "The plan is to play but it is going to be difficult," Murray said. "I need to play it a little bit by ear, as well, because I just don't know how the body is going to respond." The Davis Cup quarter-final could pit Murray against Novak Djokovic, but it is not yet clear whether the world number one will play in the tie. Murray's schedule will see him playing on clay in the build-up to next month's French Open before switching to grass at Queen's Club and Wimbledon. The Briton is also focused on defending his Olympic gold medal in Brazil in August, with that tournament to be played on hard courts. 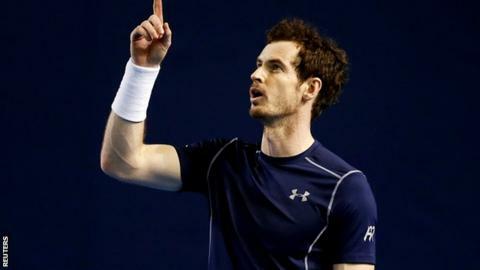 "These next couple of months are going to be extremely difficult," he told BBC Sport as he launched his own charity tennis event, which will take place in Glasgow in September. "Changing surfaces - almost on a weekly basis - does increase the chance of injury significantly: not many players would go from playing a grass court tournament one week straight onto the clay the following week with only a couple of days preparation time. "So I need to make sure my body is good and healthy through the summer because it's going to be a long summer with the Olympics, many long flights, change of surfaces, different continents and different conditions - so I just now need to respect how my body feels as well."